The Agency for Science, Technology and Research (A*STAR; Singapore&apos;s lead public sector agency for economic oriented research) and the National University of Singapore (NUS) have signed a Memorandum of Understanding (MOU) with leading pharmaceutical companies GlaxoSmithKline (GSK), Pfizer, and Merck Sharp & Dohme (MSD) to establish the Pharma Innovation Programme Singapore (PIPS). 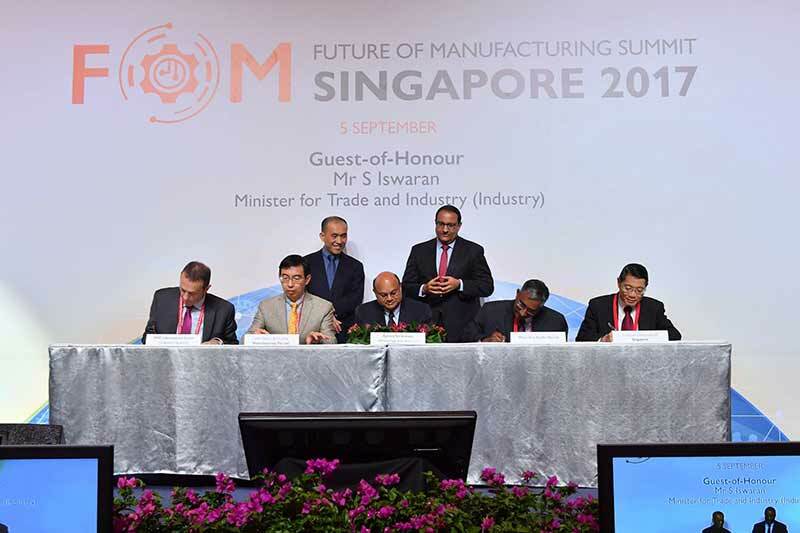 The MOU was signed at the inaugural Future Of Manufacturing (FoM) Summit. Organised by A*STAR, with support from the Economic Development Board (EDB) Singapore and SPRING Singapore, summit brings together senior top executives from Multinational Companies (MNCs), Large Local Enterprises (LLEs), senior government officials and leading technology providers to exchange ideas on adapting and capturing opportunities in the complex and fast evolving manufacturing landscape. In his opening speech at the Summit, Mr. S. Iswaran, Minister for Trade And Industry (Industry) said that the vision is for Singapore to lead the way in the global transformation of Pharmaceutical Manufacturing to create unique value for patients, the pharmaceutical industry and for Singapore. The Minister also referred to a partnership with Siemens, which has established its ASEAN regional headquarters in Singapore and is collaborating with ARTC (Advanced Remanufacturing and Technology Centre) to develop Industry 4.0 technologies in the areas of Product Lifecycle Management (PLM), Manufacturing Operations Management (MOM) and Totally Integrated Automation (TIA), as well as data analytics that enables enterprises to create a digital image of their entire value chains. The resulting intelligent data model, known as “digital twin”, makes it possible to manufacture extremely high quality products by merging virtual and real product development. The Summit is part of the FoM series of industry events, which also includes the launch of A*STAR’s Tech Access Initiative later this week. Announced in the FY17 Budget, the Tech Access Initiative provides access to A*STAR’s installed base of advanced manufacturing equipment/facilities, ranging from inspection tools to advanced equipment such as robotised 3D scanners and laser powder beds for additive manufacturing. SMEs can learn, experiment and prototype with the advanced tools, thereby mitigating the high upfront cost of investment. With the experience gained, companies can opt to scale up and acquire the equipment to capture new business opportunities. The launch of A*STAR’s Tech Access Initiative will be made at the opening of the Industrial Additive Manufacturing Facility (IAMF) that is jointly supported by A*STAR and EDB. Additive Manufacturing (AM; more commonly known as 3D printing) tools at the IAMF are part of the tools made available to SMEs under the Tech Access Initiative. A*STAR also has a centralised platform under SPRING&apos;s SME Portal, called Tech Depot, aimed at improving local enterprises&apos; access to technology and digital solutions. Over 40 technology solutions, include solutions developed and/or pre-qualified by A*STAR, Info-communications Media Development Authority of Singapore (IMDA) and SPRING Singapore for funding support, are available on Tech Depot. Mr. Iswaran also talked about the two Model Factories being established at the Singapore Institute of Manufacturing Technology (SIMTech) and the ARTC. These model factories are expected to commence operations by early next year and will bring together public sector researchers, technology providers and other end-users to collaborate and co-develop solutions for manufacturing. The model factories will enable companies to test-bed and build capabilities in advanced technologies, such as additive manufacturing, robotics, industrial IoT, advanced simulations and modelling.